Ironman, half Ironman, or long distance race. Whether you’re local or across the country, we will work with you on your year-long and event-specific goals, so you can reach the finish line faster and feeling stronger. Do you struggle with the balance between family, work, travel and training? Are you struggling with DNFs or disappointing races? 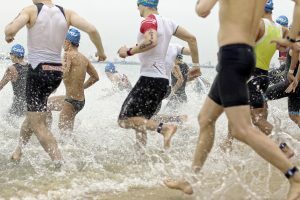 With our expert guidance, we’ll help you navigate through your Ironman or half Ironman journey with the needed training and guidance to get you through your race successfully while staying healthy and injury free. It’s time to make the most out of the time you have and train smarter. I just completed the Wyckoff triathlon and took third in my age group. After four years of running the five mile run leg within a few seconds of 36 minutes, I destroyed my old time by clocking 34:25 and that was after biking the 17 miles a full 2 minutes faster. Friends even noted how much easier my stride looked compared to previous years. Thank you! Get started in making right investment in yourself. We start with a discussion of your goals as well as an evaluation of your training and racing history. From there, we develop a totally customized training plan that’s scientifically based and targets your physiological limiters. We prescribe detailed workouts and field tests in order to monitor and adjust so that you progress from where you are now to where you want to go. And it doesn’t end there. Throughout our coach-athlete relationship, we keep track of your completed workouts and notes in order to interpret and understand how you’re responding to training. You won’t fall by the wayside or become just another number. You’re a valued member of the Rise Endurance Community. Train with exercise physiologist and sport performance expert Joan Scrivanich in a session focused solely on you and your triathlon needs. Sessions can focus on strength, core strength, form & technique, or track sessions. All sessions include email follow-up.